Christians believe marriage is a sacrament that should not be broken. When the marriage suffers, Christian based counseling can help put the couple back on the right path. Understanding how Christian based marriage counseling works can give you the hope that you need to pursue therapy. Christian based marriage counseling has the same principals of traditional therapy. The therapist will work with you and your spouse to identify marital problems. You and your spouse will then describe what you and he would like out of the marriage. These desires translate into obtainable goals. With the help of your therapist, you and your spouse will create steps to reach these goals. 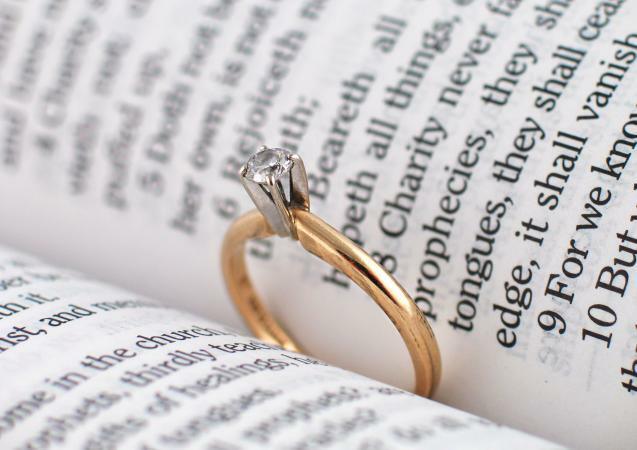 Christianity may help explain why issues occurred in the marriage. Life is challenging at times, and people lose sight of the real meaning of life, to follow God's guidance and serve him. Putting back the teachings of the Lord helps people discover new perspectives on problems. While having an explanation about why you and your spouse have drifted apart may help you comprehend the situation, it may not give you a direction. A therapist will help you and your spouse devise ways to overcome challenges so that both of you achieve what you want from the marriage, all the while keeping faith present. Once you have a direction, the therapist may give you and your spouse assignments to do with each other. These assignments help you and your spouse regain a connection with each other and with God. Learning effective communication and improving trust are two important factors in a healthy relationship. A therapist helps you and your spouse improve communication so disagreements don't turn into arguments. He may explain the need for this by sharing God's view on negativity towards others. He also may suggest Bible readings when you're having trouble with your spouse. Alternatively, he may recommend that you reflect on scriptures discussing people's sins, how they repented and how God forgives, which can help you forgive your spouse or your spouse forgive you. You may be able to find a therapist in your area on the Christian Therapist website. You can also contact a Christian church in your community or a non-Christian based therapist to ask if he can refer you to someone. Christian organizations like Catholic Charities have resources as well. Psychology Today offers a free database to find licensed mental health professionals who are faith-based counselors in your local area; the database includes extensive profiles of each therapist including their education and licensing information and many profiled therapists include personalized messages. Though pastors and church elders are not always licensed mental health professionals, many of them offer counseling that should be considered more structured, faith-based marital advice as opposed to formal therapy. While some churches only offer counseling to members, others welcome anyone who needs counseling. Keep in mind that any counselor offered through a church will likely navigate counseling based on the beliefs of that church or denomination. For example, a church that does not allow or endorse divorce will not advise divorce no matter what. Contact your preferred church to see if marriage counseling is available. Some states require counseling pastors to be licensed before providing therapy of any kind, but some states merely require counseling pastors to register as lay counselors. "Lay counselors" are people who offer counseling without a formal education in therapy and are not licensed mental health professional. It's appropriate to inquire about a marriage therapist's credentials before starting counseling. The level of emphasis on Christianity in counseling depends on you, your spouse and the therapist. Some therapists are flexible while others are rigid in their practice. Finding out where your counselor stands is important in the first session. Ask the therapist how he incorporates faith into his sessions and throughout the course of therapy. In addition, ask how comfortable he is in using more or less faith-based teachings in sessions. Many marriage therapists will make the claim of being Christian counselors, yet do not base their therapy in Christian ideals. If you're looking for Christian-based marriage therapy in which the Bible is consistently referenced, ask if the therapy is Christian-based as opposed to simply therapy provided by a Christian therapist. In Christian based marriage counseling, the focus is on God when addressing marital issues. You will follow God's teachings for guidance and encouragement. As you progress in your marriage recovery, you will also recover your faith in God.